Posted on Fri, Jan 20, 2012 : 7:03 p.m. The 33-year-old man who was shot outside the Lexington Club apartments Thursday was still in critical condition as of Friday afternoon, Pittsfield Township police said. Deputy Police Chief Gordy Schick said the man had been in and out of surgery during the day. He is being treated for life-threatening injuries after being shot in the back of the head, according to police. Schick reiterated that the three people arrested in connection with the shooting Thursday night - two 15-year-old Ypsilanti boys and a 24-year-old man, also from Ypsilanti - were the only suspects in the case. “There was a lot of good scene investigation and great interviews last night and we’re very confident we have all of the individuals in custody,” Schick said. Police responded at 7:06 p.m. Thursday to the apartment complex, 2224 Golfside Road, for a report of a man who had just been shot and was bleeding near a door to a building in the northeast area of the complex. The teens had met with the man at the complex just before the shooting, Schick said. Police said one of the 15-year-old boys shot the man in the back of the head and left him there. Police are still investigating why the man was shot, but it is believed the incident was drug-related. At about 10:30 p.m., officers surrounded an apartment within in the complex and demanded the occupants come out. The two 15-year-old boys and the 24-year-old surrendered to police. The teenagers were taken to the Washtenaw County Juvenile Detention Facility and the man was taken to the Washtenaw County Jail. Schick said police are still actively investigating the shooting and some investigators were still working Friday, almost 24 hours since the first officers arrived on scene. He said police have acted on several search warrants since the investigation began and are working on compiling their case. Some evidence has already been sent to the Washtenaw County Prosecutor’s Office for review, Schick said. Investigators were still working to gather evidence in order to formally charge the suspects, who were still being held Friday evening. Schick said officials were considering a number of charges for the three suspects. The condition of the victim is a major factor in what crimes the individuals would be charged with, he said. At the apartment complex, life returned back toward normalcy after the unusual scene of a police investigation Thursday night. 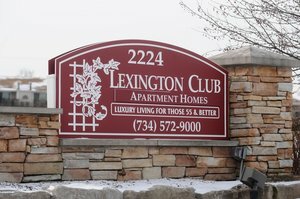 Residents who spoke to AnnArbor.com Friday said the Lexington Club apartments had always been a safe place to live. Long-time residents, who asked to not be named, said they had never had a criminal incident at the complex like Thursday’s shooting since the complex opened in 2002. They added they generally felt very safe in their homes. The shooting on Thursday did not change those feelings, residents said. Spokeswoman Lori Trainer said administrators at the apartment complex are not aware of any connection between the victims and the community at the Lexington Club. The apartments are supposed to have at least one occupant aged 55 or older, Trainer said. Trainer said officials with the complex are waiting for police to finish their investigation and are keeping in touch with investigators to establish more facts about the shooting. She said everyone with the Lexington Club is hoping for a full recovery by the victim of the shooting, and offered to provide police all the help they needed with the investigation. “Unfortunately, these days crime has no address,” she said. Sat, Jan 21, 2012 : 7:34 p.m. Isn't saying &quot;it is believed the incident was drug-related&quot; blaming the victim? Sat, Jan 21, 2012 : 4:32 p.m. Sat, Jan 21, 2012 : 1:26 p.m.
Not one of the articles has a picture of the 2 perps. So I guess the welfare and safety of Ann Arbor.com's readers aren't that important to them. Why no pictures of the bad guys???? Sat, Jan 21, 2012 : 1:56 p.m. Sat, Jan 21, 2012 : 12:30 p.m.
more questions: Victims...plural? Did I miss something in your article? I thought there was one person shot and multiple suspects in custody. Are you saying there were more people injured or are you saying victims because the suspects are considered victims somehow? and...the question that I always have to ask - these are presumably high school students, Are these students in any way connected to the as yet unreported-on string of home invasions that have been plaguing neighborhoods in Ypsi City, Ypsi Township, and Pittsfield township (and possibly other areas that we don't know about because you haven't gotten the sheriff and Ypsi Police to report on it?). You have identified them as Ypsilanti youths - you haven't said if they are Ypsi city, Ypsi Township or if they are Ypsi School district or Willow Run? Just asking for a little more ingo. I know you can't identify them because they are a) innocent until proven guilty and b) under age but...even that little bit of information would be helpful to those of us reading your blog. Sat, Jan 21, 2012 : 6:50 p.m.
right - but then why is the crime ID'd has happening in Pittsfield Township but the people ID'd as being from Ypsilanti? I'm just trying to get some facts straightened out. I read the current article as saying some Ypsi people came to Pittsfield Township to do a drug deal of some sort and this guy got shot by two 15 year olds. JUst trying to unravel the spin and sensationalism. Sat, Jan 21, 2012 : 2:32 p.m. While Lexington has an Ypsi address, it is in Pittsfield Township and in the Ann Arbor school district (Huron High). Sat, Jan 21, 2012 : 2:03 p.m. Sat, Jan 21, 2012 : 1:54 p.m. Sat, Jan 21, 2012 : 12:18 p.m. I am going to make a suggestion here. The headline says &quot;two 15 year old boys arrested after...&quot; there were actually 3 arrests and two 15 year olds and a 24 year old. I get that its sensational the two 15 year olds where arrested but the headline is inaccurate. @Keepinit2real...might could point to &quot;parents&quot; instead of just their mothers. Both parents should be held accountable. Involved or not. Sat, Jan 21, 2012 : 11:53 a.m. This is just too bad, and I hope the victim makes a full recovery. It's unfortunate that the criminals were of such a young age, though now is the time for them to learn there are consequences for their actions. Sat, Jan 21, 2012 : 3:06 a.m. These kids need to be tried as adults. Praying for the victim and his family. Sat, Jan 21, 2012 : 2:42 a.m.
why is a 24 year old fratenizing with 15 year olds in the first place? Where are the parents and do they not know who their kids are spending time with? Keepinit2real has a point, their should be some accountability to the parents. Did the gun belong to one of the parents, where did a 15 year old get a gun? Sat, Jan 21, 2012 : 12:58 a.m. I believe the kids and the mothers should be charged. Parents need to be held accountable for the things that their kids do and in some cases charge the both of them. Tue, Jun 12, 2012 : 5:49 p.m. Kids do what that want these day's. Parents may try to have some control over their children, but it's not easy with the way they act. If you look for more information yourself, you will find that one of the 15-year olds. the one that shot the man, has been charged with 6 felonies within the past 2 years. his parent's have tried to get him help, and so have the courts, but the kid just doesn't listen. maybe the time he will be paying will help him, if not, then that on him. not his parents. Sat, Jan 21, 2012 : 2:48 p.m. Sat, Jan 21, 2012 : 5:07 a.m.
And the fathers??? Who has the bigger influence on sons, mothers or fathers? ?